We've only been in San Francisco for four months, so we have barely scratched the surface when it comes to things to do, and see, and eat. I am literally adding restaurants and concert venues and bars to the list on my phone on a daily basis. And while we've been good about exploring and not re-visiting too many favorite spots yet, we always go the extra mile when we have visitors. Last weekend Ian's mom and aunt came into town and it was the perfect fall day, sunny with a slight chill in the air. 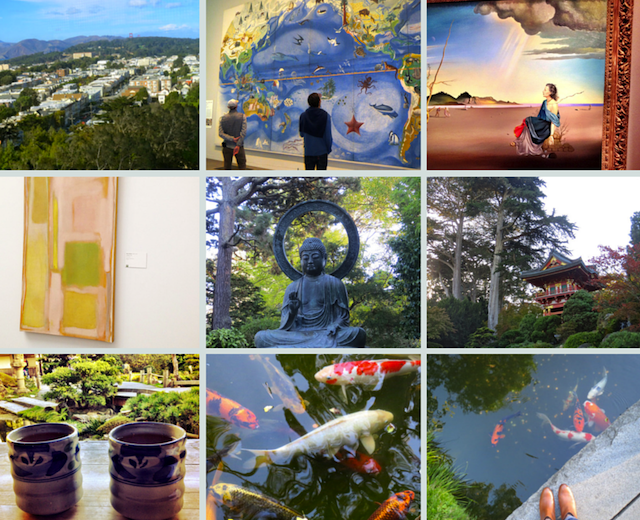 We spend most of the day exploring Golden Gate Park, visiting the de Young Museum (we were a few days early for the Keith Karing exhibit which was a bummer), warming up with hot tea at the Japanese Tea Garden, and catching a glimpse of the last roses of the summer.